You know, sometimes the oldies are the goodies. I first posted this workout in February 2013, and it’s become one of the most-watched videos on my YouTube channel (PS, that’s a thing you can subscribe to). So it’s back to the archives for this week’s workout!! 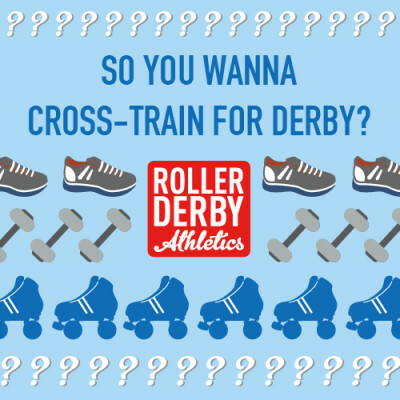 The great thing about this workout is it requires only a towel (or shirt) for equipment, so a lot of Roller Derby Athletics enthusiasts like to do this with their team after practice at the rink. Want to juke better, bust through scrum starts, stop and turn quickly to force a cutting penalty, or be able to move yourself at lightning speed across the track to block out a slippery jammer? Of course you do! That’s why today’s workout dials in on agility training. You’re going to have the fastest feet in the game if you add this to your routine once or twice a week! I’m calling this Seven Minutes in Heaven because it’s (obviously) seven minutes long, and because you’re going to keep your feet ultra-light throughout – like you’re jumping on clouds in a cartoon heaven. Got it?! Good! It’s short, so you can add this to the end of another workout or a practice to give yourself an agility boost. If you’re feeling frisky, do it 2 rounds through. Equipment: 1. A hand towel or t-shirt. 2. A timer on 45/15 second repeats (or a stopwatch) I use the Seconds Pro app on my phone to count the intervals. Workout: Do each of the following for 45 seconds, then take 15 seconds of rest. Watch the video through to see what the moves look like. I go through all the moves at the end of the workout in the video with a little how to. I recommend wearing shoes for this workout if you have knee or ankle issues – it’s hoppy! Please remember to warm up beforehand, and cool down with a stretch afterwards – pay special attention to your feet and calves after the workout. I like to roll the arches of my feet on a golf ball or lacrosse ball to work out the tension. Thanks for watching – and thanks for sharing these videos with your friends and teammates!